My interest in music, more specifically percussion, began in the third grade when my teacher brought in his drumset as a little "motivation" to do well on STAR testing that year. He allowed all of us to play a little solo in front of the whole class for thirty seconds each. At the time I was already involved in soccer, and I loved it, but as soon as I sat behind that set I knew that I wanted to be a drummer. I was happy to find out that my school had a percussion class, but unfortunately I wasn't allowed to join it for another two years when I was in fifth grade. So when two years passed and I finally started fifth grade, I was one of the first to join the class. The first instrument I started out on was a concert snare drum, then later a concert tom and congas. I was in the class for two years until I had to start middle school, but leaving elementary meant I had to choose between soccer or percussion. At the time, it was the biggest decision of my life, and I thought about it for a long time but finally decided to leave soccer and continue with percussion. I later auditioned and made the snare line at Reyburn and was introduced to a whole new world of percussion. Along with being new to the concept of a drumline, I was also introduced to drum corps for the first time. The first DCI show I saw was The Blue Devils' 2006 show and I was instantly a huge fan. I knew that one day I would be marching in a drum corps, and eventually I'd be a Blue Devil. All throughout high school, I spent my spare time drumming in my garage and learning all kinds of music from various different corps. At one point, I could fill up two three-inch binders with music from drum corps or just random things people would write, and I knew most of it by memory. I would literally spend twelve hours a day drumming in my garage and would only take a break to get something to eat. By my junior year, I figured it would be time to try out for a drum corps, so I auditioned for The Mandarins snare line and made it. That summer was the hardest I had ever worked, but it was some of the most fun that I had ever had playing music. 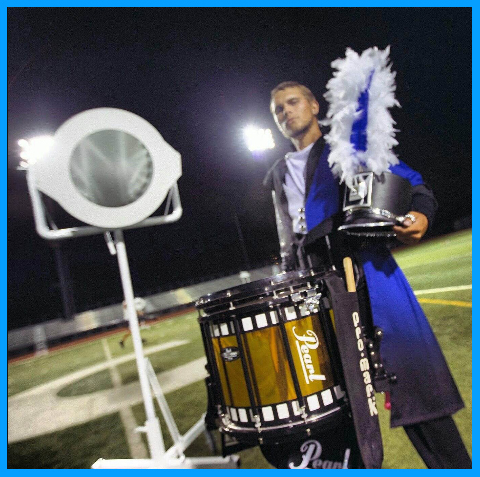 The next summer was when I made the Blue Devils B drumline, and became a part of the Blue Devils family as well as winning my first world championship and DCI high Drum title. The following summer was when I finally made it into the Blue Devils A Drum and Bugle corps as a snare drummer. Through 2012, 2013, and 2014 I won two DCI World Championships, A high percussion caption award, A DCI finalist silver medal, placed second in the world in percussion, and was awarded the highest score ever recorded in DCI Finals history with a 99.65. Music has had the biggest impact on my life more than anything and I love it too much to let it go. In fact I hope to be a person that helps change the percussive world for the better and hopefully helps the growth of activities such as DCI and WGI. Now that my marching career is over, I have been continuing my teaching resume by teaching here in san jose at the rhythm academy, Leigh Highschool as well as various other schools around the state. I plan on working towards my masters degree in music composition over the next couple of years.